Alright, I know you were expecting Strawberry Shortcake's insights regarding SEO. OMG, an article about a condition I deal with twice a month! Yes, I'm one of those ever-so-lucky women who must battle an insane urge to happily decimate the world not simply once, but twice (count 'em, 2!) every month! So with that, I realized….I needed someone a tad more ferocious than Strawberry Shortcake, and set about whirling my mental protons to inquire to the Cosmos, what brilliant woman would fit my needs for such a delicate topic! But then! OMG, but then, right as I had decided upon Mother Theresa…..it happened. A shrill, piercing sound began to emanate from my kitchen. The mooses started howling and the Twitter Budgies ignored it entirely and it was as if the Universe collectively held its breath as…..
A chillingly vicious huge black hole started forming in my kitchen! My gosh, it was immense. Amazing. Uncanny. And it was…. The horror. It left my HDTV alone, my priceless collection of Breyer Model Horses untouched…it only brutally consumed….my coffeemaker. Frantically I scrambled over my chair in a vain attempt to rescue it, but alas, I was too….late. And the effects of my forced caffeine-free state started to affect me immediately as I slumped back into my chair and waited for the next caffeine deprived interview to commence. Somehow I wasn't surprised whatsoever to see Xena The Warrior Princess standing next to my computer. We interrupt this blog post to inquire about the following! 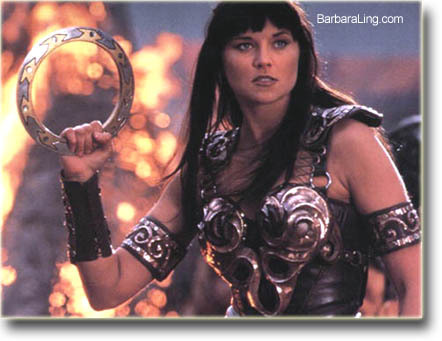 Is Barbara Ling dating herself by using Xena? If so, kindly enjoy the following to get a tremendous feel for what true Buddy Action shows should include. Now imagine that woman….with PMS. We now return you to our regular blog posting. Me: So Xena, tell me. What's it like being a Warrior Princess? And do you have any spare coffee by chance? Xena: The first time you pick up a sword, you become a target. And the moment you kill…everything changes. Everything. Me: I see. Some latte perhaps? Me: Right. Well, now that you're in the 21st century, I hear you've became one of the most popular bloggers known in the cosmos astonishingly quick. How did you accomplish that? Xena: Blogging is like fighting to the death. You never give up. Or you die. I didn't give up. It's like a pond of prior calmness. See how calm the surface of the water is. That was me before. And then I throw in a stone. The size of Mount Olympus. The water ripples and churns; that's what I became. I embraced my destiny. Me: One of the challenges to blogging is always keeping up the faith, even when you would prefer to indulge in a do-it-yourself root canal without anesthesia. Tell me Xena, how do you blog when you're incapacitated with PMS? Me: The feeling you get every month or so when you find yourself seized with a desire to crush small villages and cover entire landscapes with sparkly land mines. Xena: That's normal, I feel that way every day. Me: Ah. So every day it's a struggle to focus? Xena: Yes. Might is right, even when it's wrong. It's up to me to battle these inner demons and turn them into goodness. Me: And how do you do that? Xena: I think pleasant thoughts about relaxing exercise like this. Me: What does that do? Xena: It allows civilization to last whole a few minutes longer. Me: I see. So what would be your suggestions for other women who fall prey to PMS yet still need to blog? Xena: Here are my 3 unchangeable rules for utterly crushing it when it comes to blogging with killer PMS. Rule #1.) Realize it's not you that's feeling bad. It's the rest of the world that requires an immediate attitude adjustment. Rule #2.) Ignore the fact that every blogger who disagrees with you obviously has a death wish. If that fails, watch the following. You'll feel more in tune with your inner Warrior Princess. Me: Um, well, yes, but you really didn't give any personal insights into killer blogging with PMS. Xena: (withdrawing her sword and approaching menacingly) Really sure? 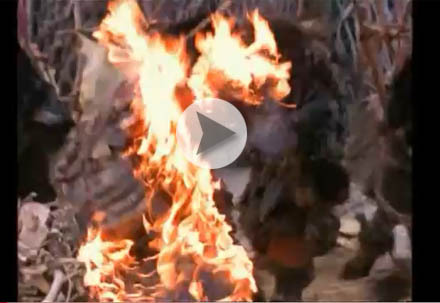 Xena: (towering over me with molten sparks flying from her eyes) What did you say? We interrupt this blog post to explain that right at that precise moment, the coffee-pot consuming black hole reversed itself and returned Barbara's coffeepot back to this particular reality, sucking up Xena, her sword and her survivalist blogs in the process. Gentle reader, I know I had promised Strawberry Shortcake today, but honestly for the life of me, I'm just not feeling too peachy right now, you know? It seems like I'm a wee bit….touchy….and sensitive….and am viewing issues with over-reacting at the least little thing like my kids aren't chewing their breakfast in unison or my mooses are refusing to communicate in English or …. you get the idea. I think I need to work off this angst. Hey, maybe watching a few episodes of Xena The Warrior Princess would help me…but I'm sure that's from beyond your time. Trust me, she'd make an awesome blogger, don't you think? I promise to have a more exciting post tomorrow!